December 28, 2015 This blog post has been updated. The names of the children have been determined and their ages have been used to identify the dates of the photographs. The blog post has also been updated to show the photographs in chronological order. The first grouping of photographs is estimated to have been taken in 1953. The second grouping of photographs is estimated to have been taken in 1957. 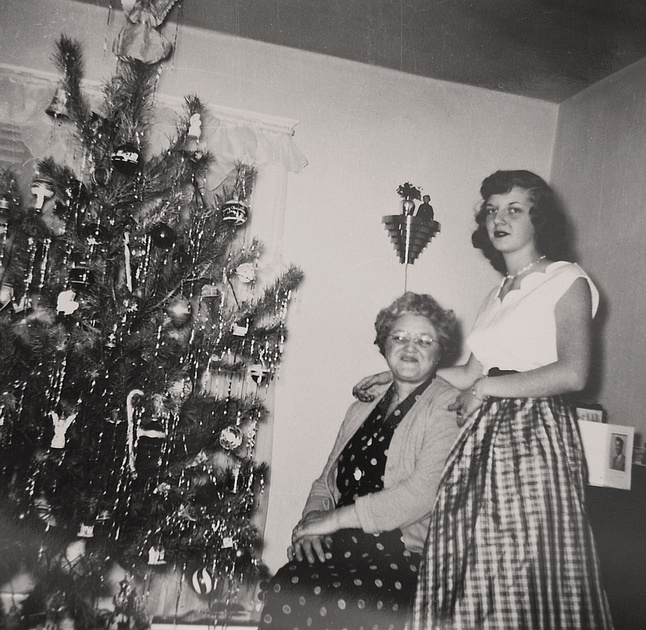 The Helen Tillie Bukowski Collection contained vintage Christmas photographs that appear to have been taken at different holidays. Some of the photographs may have been taken in the late 1940's. The photographs were most likely taken at the home of Helen Tillie Bukowski which was located at 729 East 24th Street in Erie, Erie County, Pennsylvania. The photographs were taken in the same location as the piano and carpet are common elements. The first grouping of the photographs feature wall paper in the parlor. The second grouping of photographs feature painted walls in the parlor. 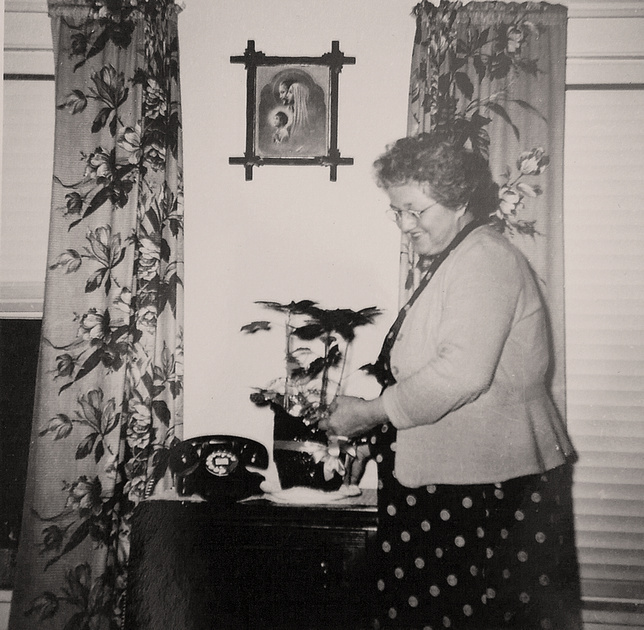 This photograph of Marian Elaine Murosky was taken December 25, 1951. 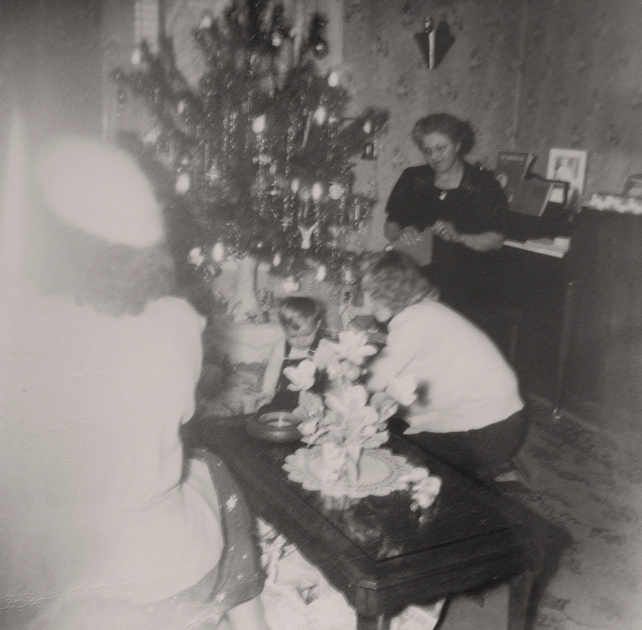 The back of the photograph has a hand written label that reads "Marian Dec 25 1951". The photograph was most likely labeled by her mother Helen.She would have been 16 years old in this photograph. The first grouping of photographs feature Helen Tillie Bukowski with her grandchildren. Helen's daughter Rita Ann Murosky is also featured. The parlor in these photographs has floral wall paper. This grouping of photographs is estimated to have been taken in 1953 based on the ages of the grandchildren. Helen Tillie Bukowski with her grandson - Ronald Murosky, son of Edward V. Murosky and Margaret Forgash. Helen's husband, Anthony Harry Murosky, Jr., is the man in the framed photograph on the far left side of the piano. Helen Tillie Bukowski with her two children. 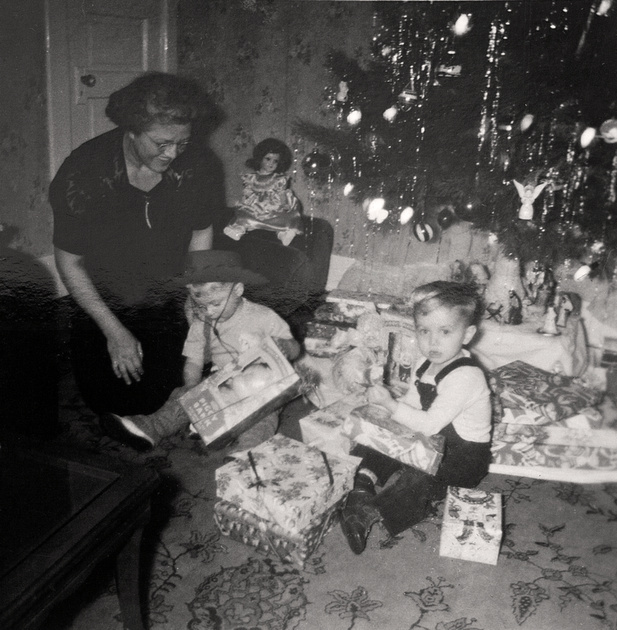 The boys are Ronald Murosky, son of Edward V. Murosky and Margaret Forgash (center) and Kenneth Niemi, son of Rita Ann Murosky and Walter E. Niemi (right). Helen Tillie Bukowski watches Kennth Niemi, her grandson, open a gift with assistance of his mother Rita Ann Murosky. The woman her back to the camera is currently unknown. Helen Tillie Bukowski stands adjacent to an ironing board. 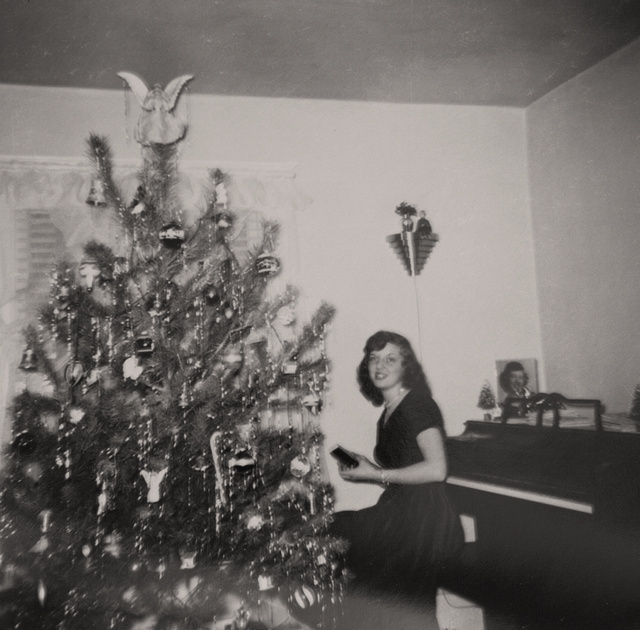 Her grandson, Kenneth Niemi, plays below the Christmas tree on the left side of the frame. Ronald Murosky is on the right side of the frame wearing a cowboy hat. Helen's daughter Rita Ann Murosky is standing on the right side of the photograph. The second grouping of photographs feature Helen Tillie Bukowski with her daughter Marian Elaine Murosky. 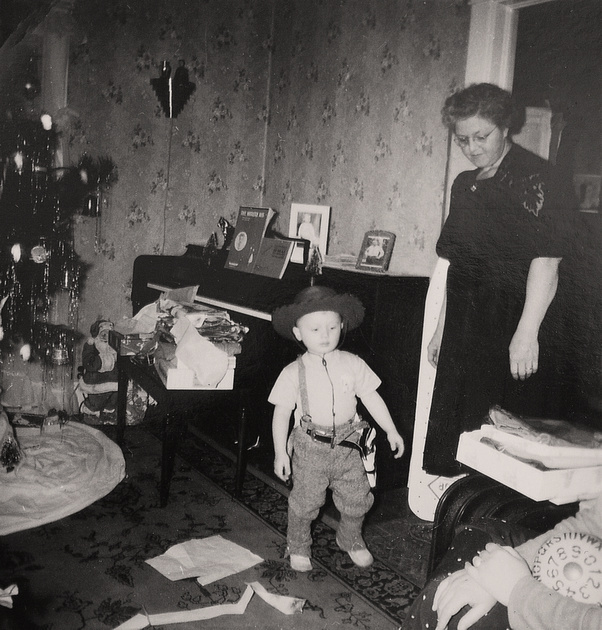 This grouping of photographs appears to have been taken in 1957 based on the age of the baby in the photograph. 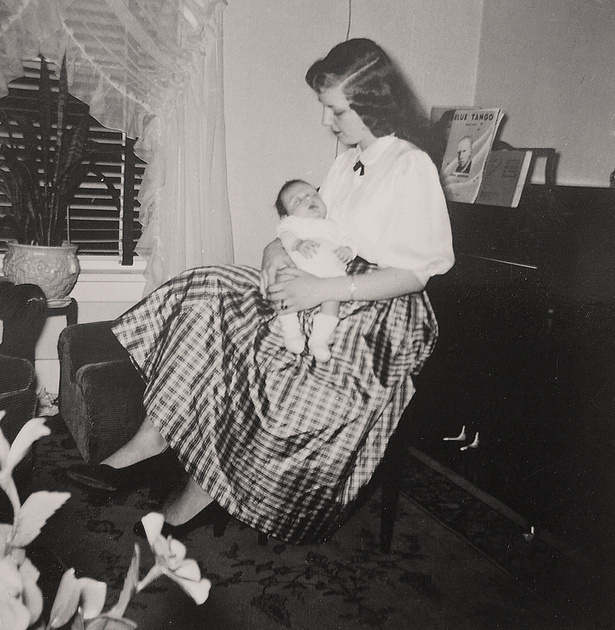 Marian Elaine Murosky holding her daughter Janet. Helen Tillie Bukowski with her daughter Marian Elaine Murosky. Helen Tillie Bukowski carries a poinsettia. Note the rotary phone in the photograph. Note the old radio behind Helen. The photographs were part of the Helen Tillie Bukowski Collection. Helen was married to Anthony Harry Murosky, Jr. Rita Ann Murosky and Marian Elaine Murosky are their daughters. Rita Ann Murosky married Walter E. Niemi - their son Kenneth Niemi is included in several of these photographs. Anthony and Helen's son Edward V. Murosky married Margaret Forgash. Their son Ronald is shown in several of the photographs. Photographer Unknown. Editing and digital restoration by Michelle M. Murosky. Helen Tillie Bukowski is my great grandmother. Her son Arthur Murosky is my paternal grandfather. Rita Ann Murosky and Marian Elaine Murosky are my great aunts.